After a long long hiatus, Saturday Shorts is back! Well actually, that means I’ve finally started to use up enough products to have concrete opinions about them. So, welcome to volume six, bath products! This is one that I chose among Eula’s recommendations from Organix. 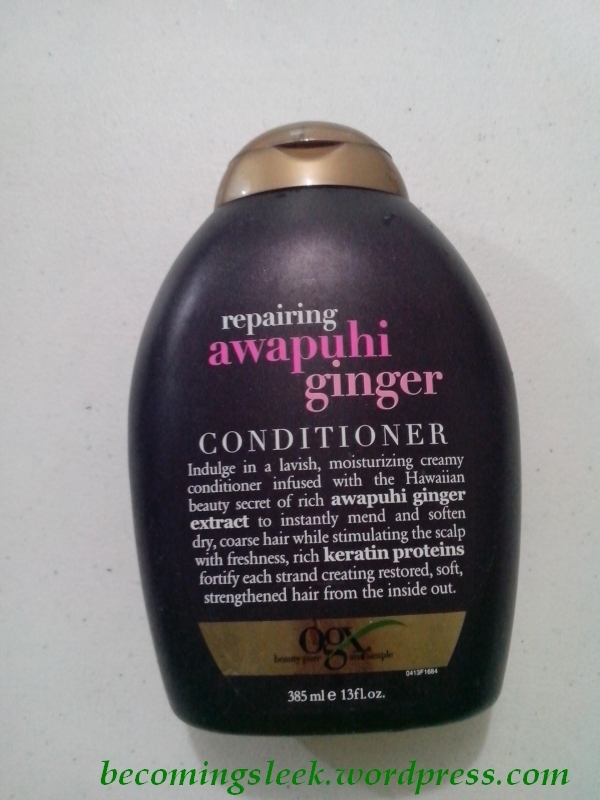 I thought that Awapuhi Ginger smelled the best, and the scent really appealed to me. I use this at most twice a week; I wanted to avoid making my hair too used to it. My hair always smells fresh and lovely right after I take a bath with it. It feels super soft and silky too, but that goes away after a day or two. I’m wondering if I’m using it a little too infrequently. This is available in department stores (I bought mine in Landmark), and probably also in supermarkets as well. It costed me Php499 for the 385ml bottle. This is a huge bottle btw, and I feel like I haven’t made a significant dent yet. 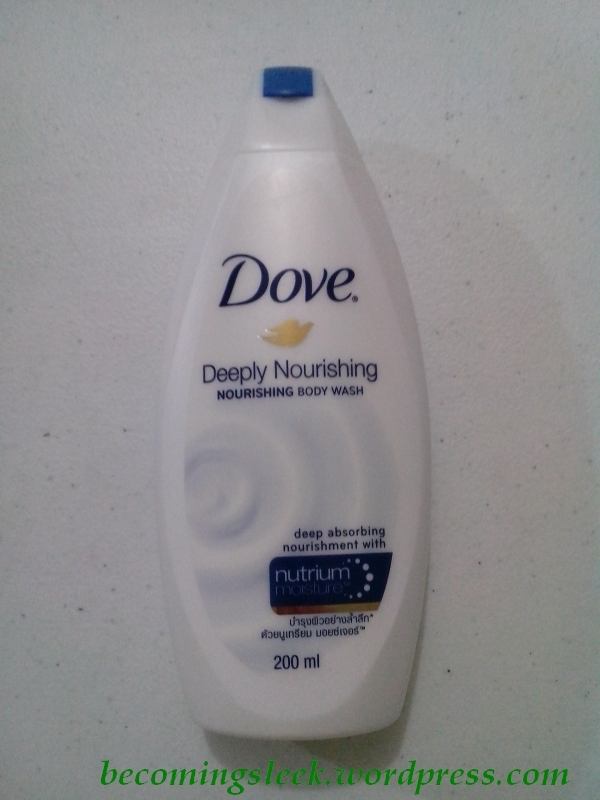 Ah Dove, a very classic household name. This body wash though is something I’ve never tried before, but through Sampleroom I was able to get a full sized sample and try it out. I’ve already finished the sample and already bought a few bottles for further use, I’m that satisfied with it. It’s a very gentle cream that I just lather all over my body using only my hands (my derma forbid the use of abrasives like loofas), and I feel very cleansed. My sensitive skin loves this stuff, and has never reacted badly yet. It has become my current mainstay, and my daughter uses it too. This 200ml bottle costs Php90 (very reasonable! ), and a bigger version, 400ml, costs Php175. 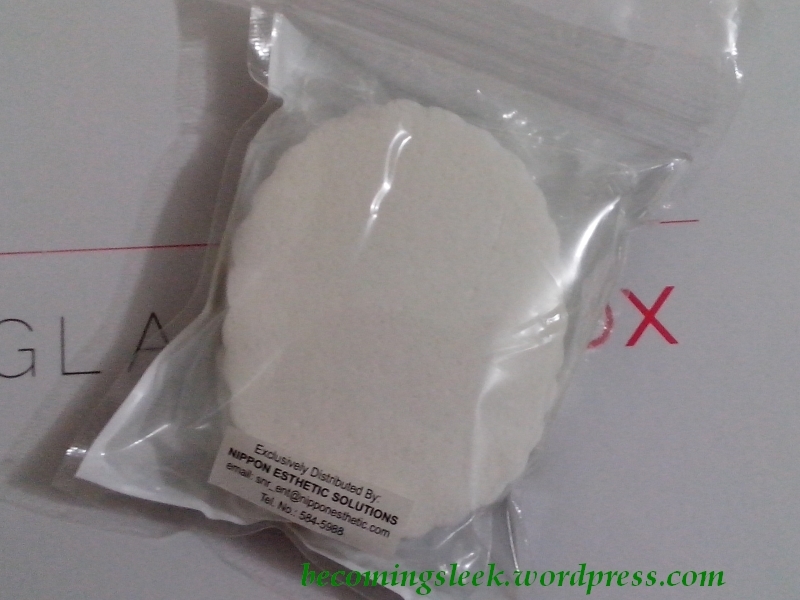 Lastly we have this hair mask from one of my previous Glamourboxes. I really like how this performs on my hair; it’s almost as good as the Organix conditioner. 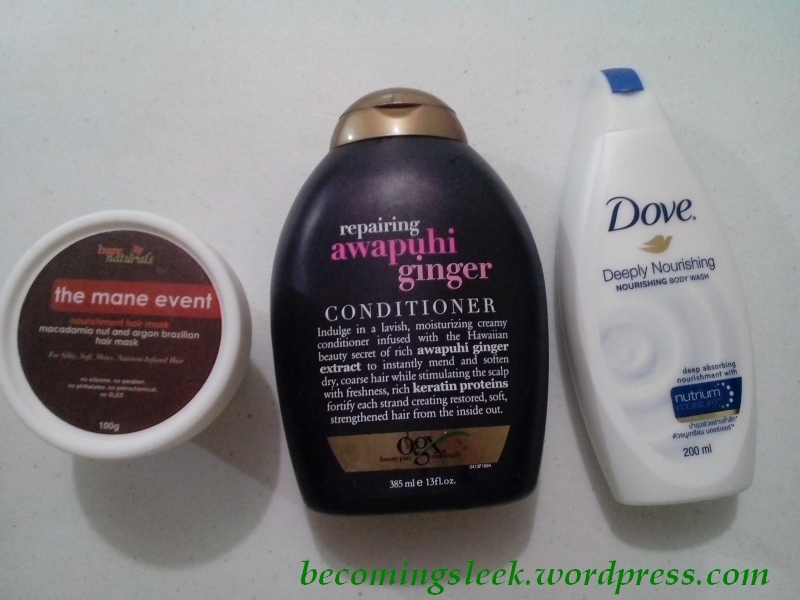 This is what I use in between the days I use the Organix one. I like the spatula that comes with it, as well as a built-in tray to hold the spatula, although of course by that time my hands are too wet and slippery that it’s still quite hard to manage. My hair feels nice and soft and smells fantastic after use. Unfortunately my husband does not like the scent of coconut (we didn’t realize that previously! quite the discovery) so I have stopped using this. The full sized version of this (130g) costs Php380. 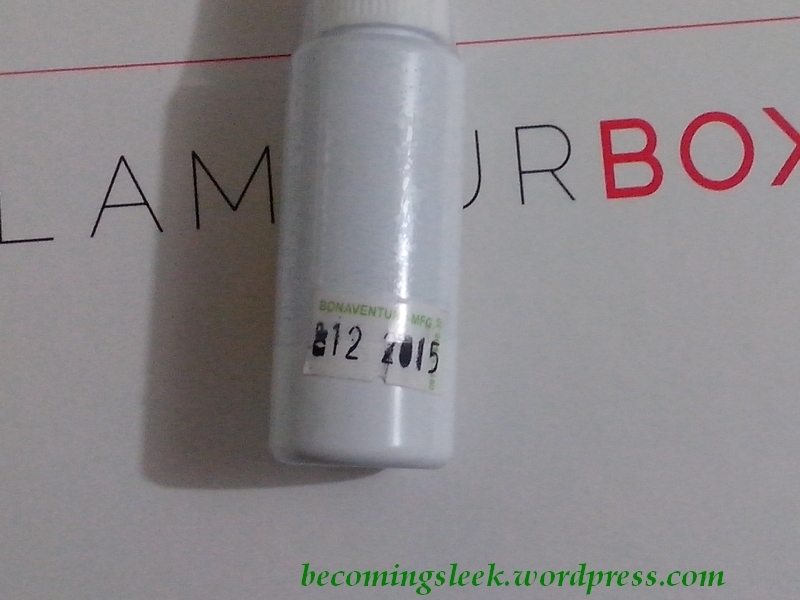 Last June I was introduced to the brand Barenaturals by Glamourbox. They were kind enough to include two products, one I already reviewed (Vitaminstix) and one that is slowly becoming my HG primer. 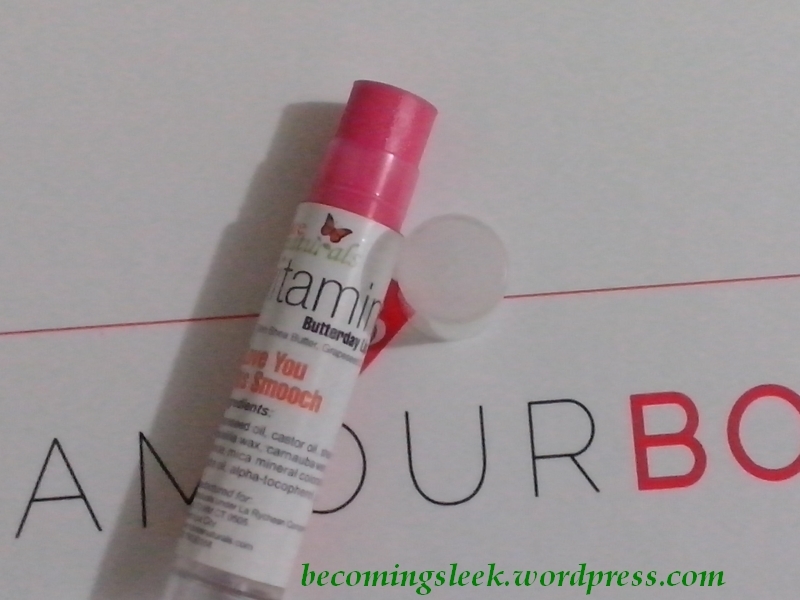 This primer is Barenaturals Skin Perfecting Primer, which I received in the June Glamourbox. This primer comes with 30ml of product housed in a relatively plain looking white plastic pump bottle, with a really weird cap. The pump itself is great as it dispenses just the right amount of product for my whole face (well, the parts with the pores). The bottle itself though gives quite a poor impression, as it feels cheap and not sturdy at all. On the other hand, the product itself is something else! 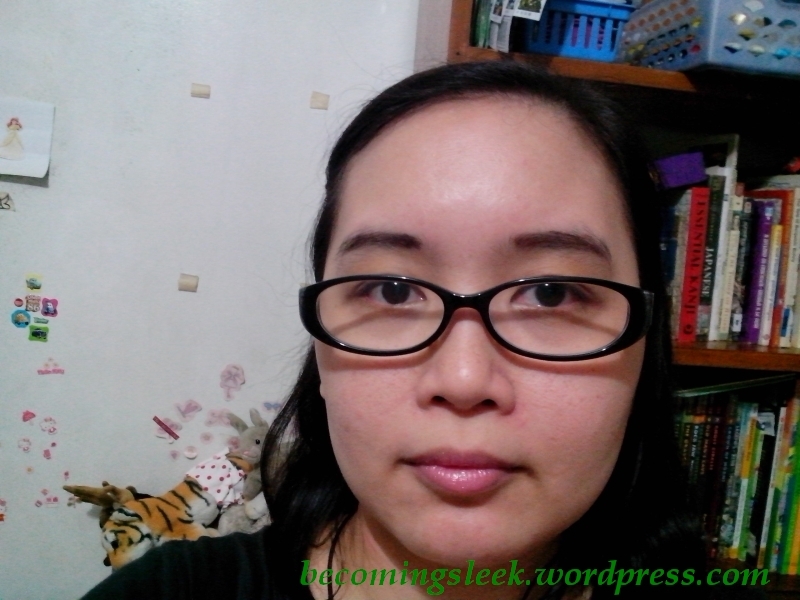 This primer is a little runnier than the other two primers I’ve tried (Maybelline Baby Skin Pore Eraser and Benefit Porefessional), but I dare say that it performs better. 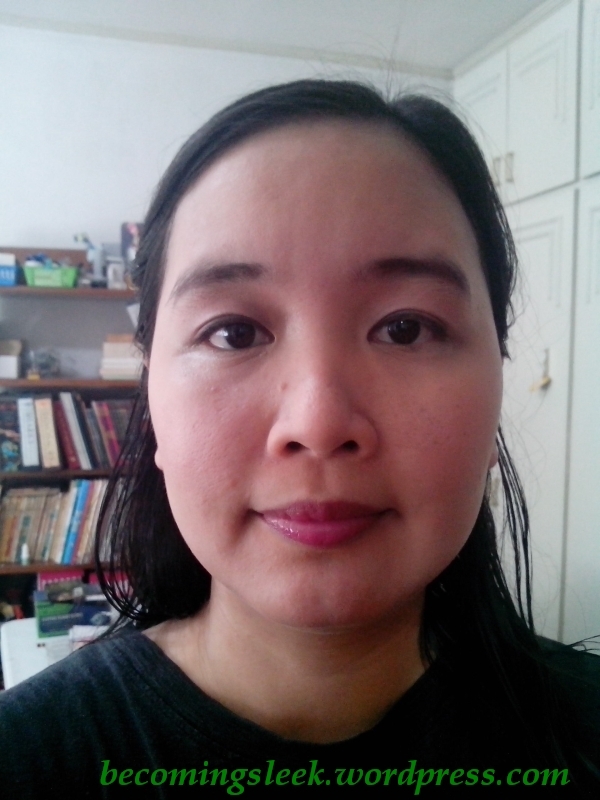 The most telling difference is how it reacts (or put it in another way, how it doesn’t) with my skin. I have an annoyingly sensitive skin, and will get itchy at the slightest hint. A worse response would be to break out in acne or hives. 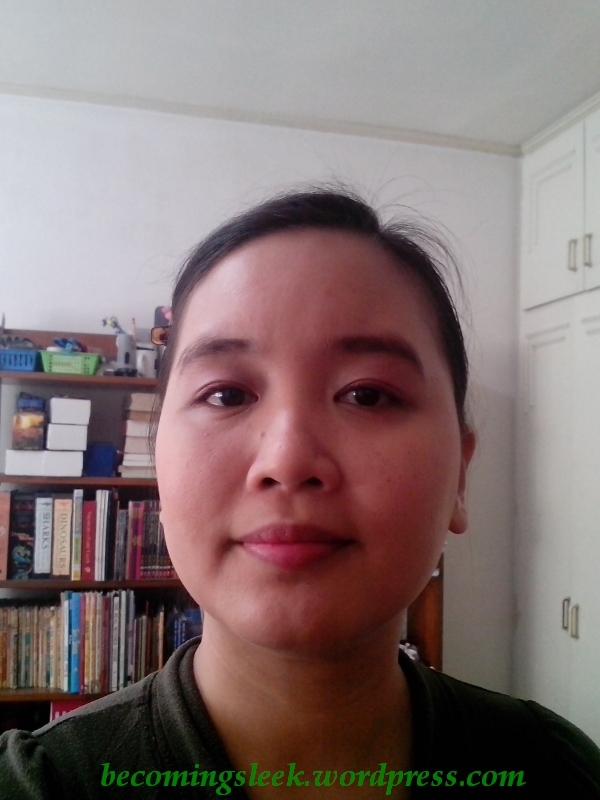 What I like about BN’s primer is that not only does it not make my skin flare out, but it actually provides a layer that keeps me from breaking out on the non-sensitive skin-friendly products! How awesome is that?! This is how one pump of product looks. 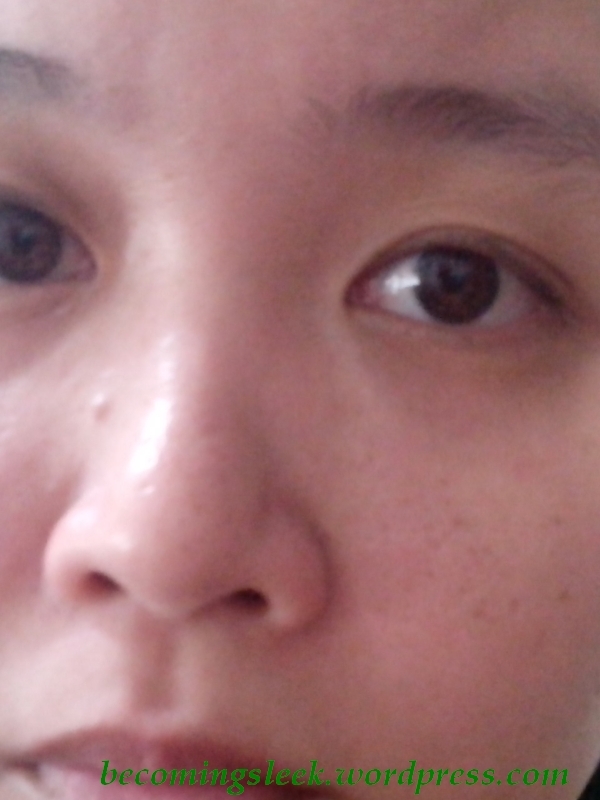 There is actually a lot of it, but I have really obvious pores on both cheeks, on my nose, and a bit on the sides of my eyebrows. For users with less pores than me, perhaps half a pump will do. 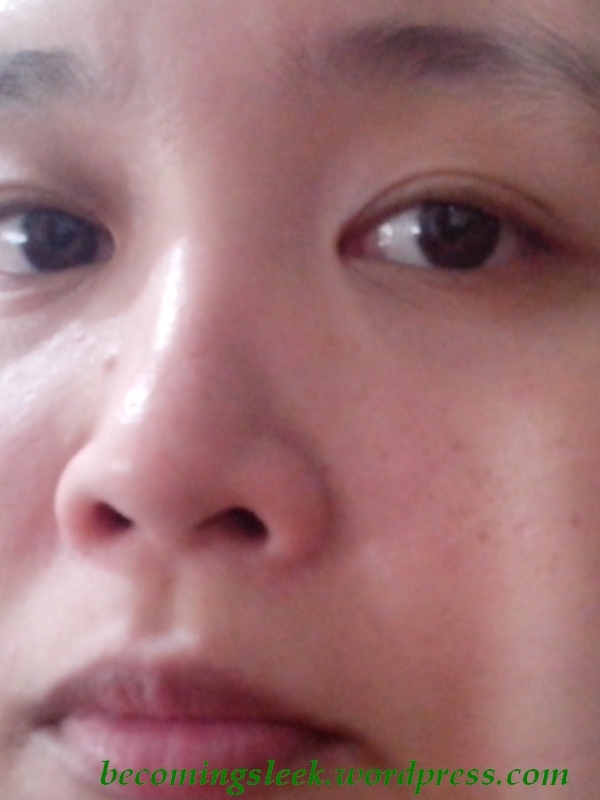 This is how it looks like when applied on my pores, compared to bare skin. 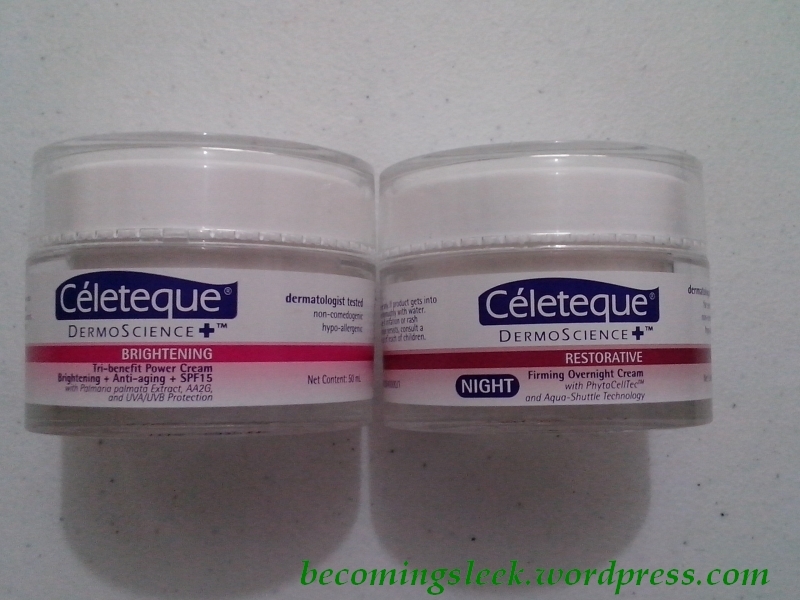 Please note that prior to application, I have applied some skin care on my face (Celeteque Hydration Moisturizing Mist and Celeteque Brightening Tri-Benefit Power Cream). 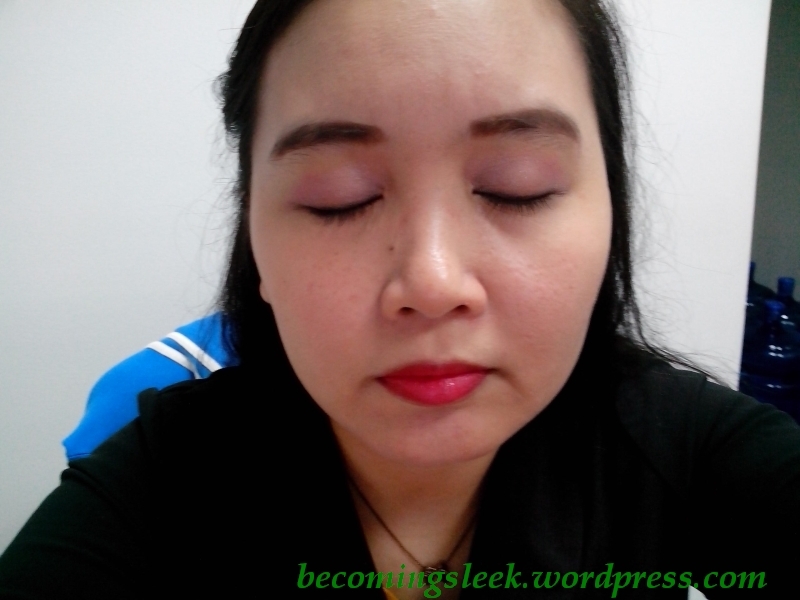 It is not really very obvious since the product is watery, unlike how the Maybelline Pore Eraser or Benefit Porefessional works which is to blur the pores already upon application. 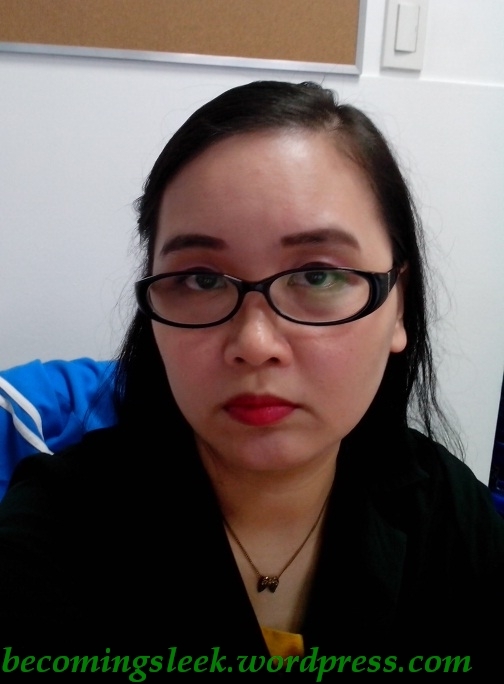 However once you put on foundation or BB cream (TCfS BB Cream in this case) you can see that it really provides an even surface for it to work on. I’m starting a new category: Favorites! 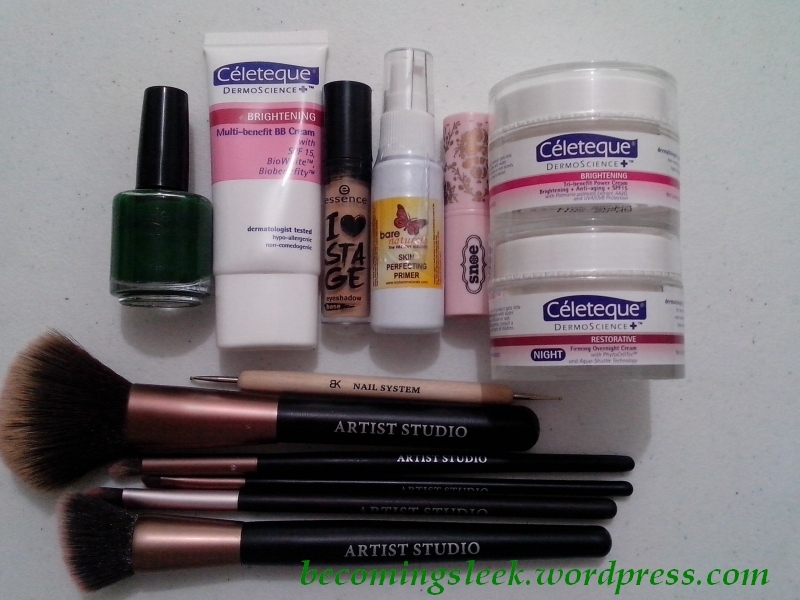 I was inspired by my fellow bloggers and I decided to feature my own monthly favorites. I will try to limit this to 5-6 items (about one in each category) to avoid having excessively long posts. 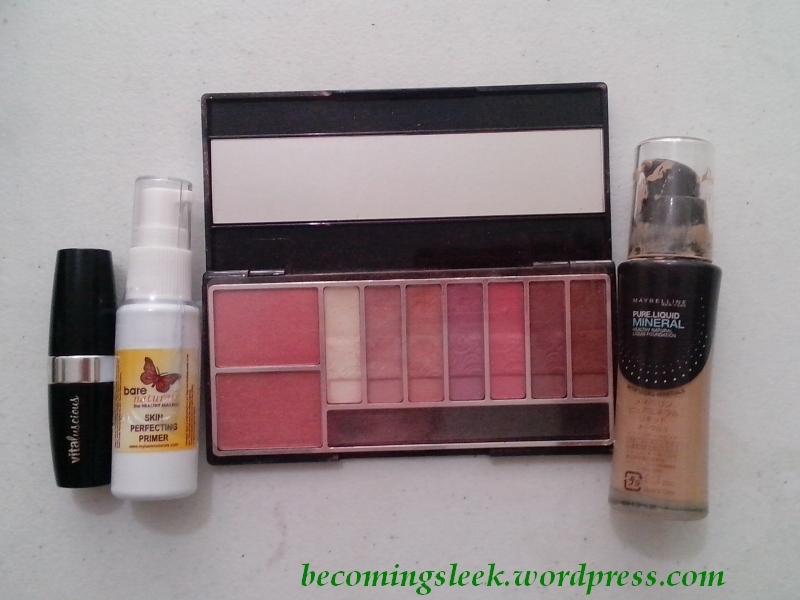 Without further ado, here are my June Favorites! That is definitely way more than 5-6 items! 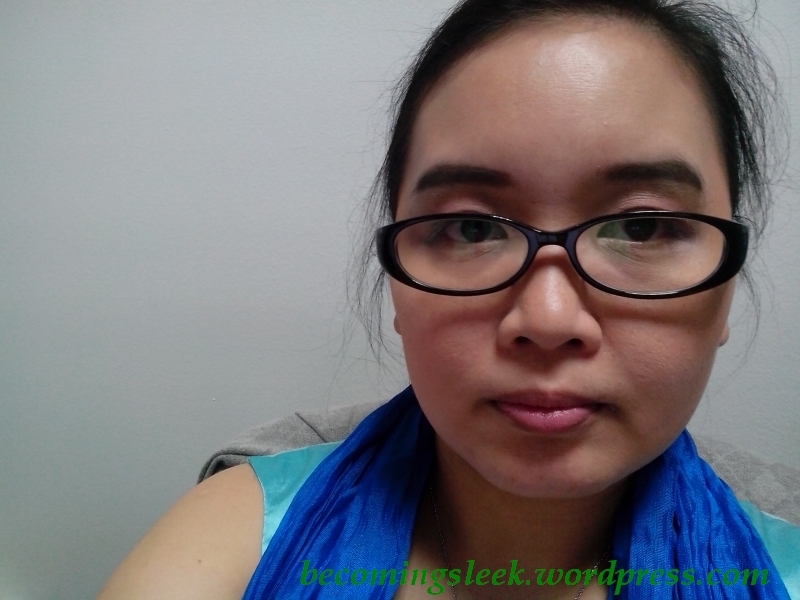 I really love this eyeshadow base, as you can see from my review. I’ve taken to using this everyday and it really helps keep my eye makeup stay put. It’s also quite inexpensive. I’m going to cheat and put two in this category. 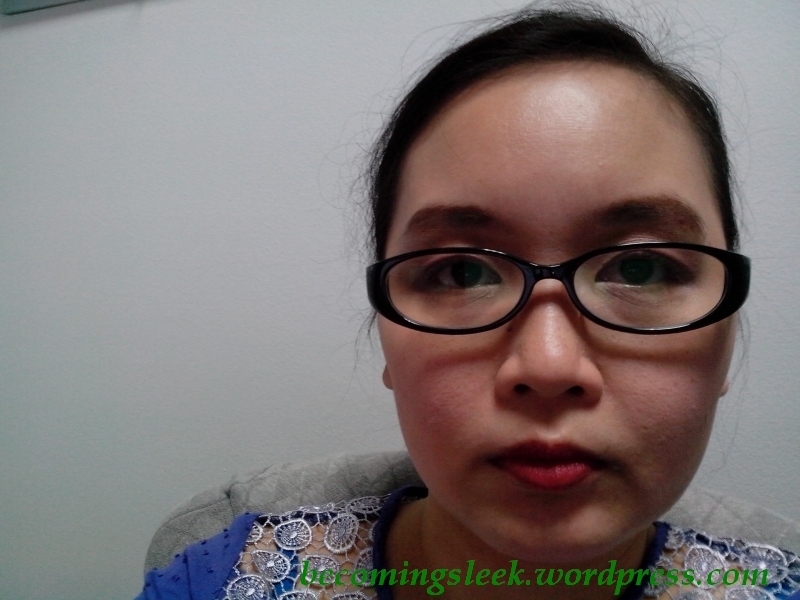 The first is the primer I received in my June Glamourbox. 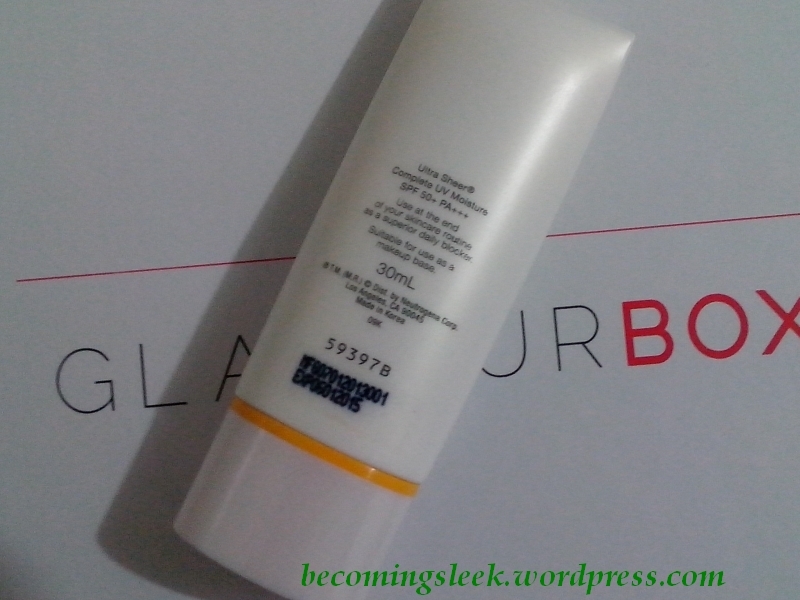 It’s a great primer and performs pretty well, even with that horrendous packaging. It’s a mainstay for my everyday makeup. 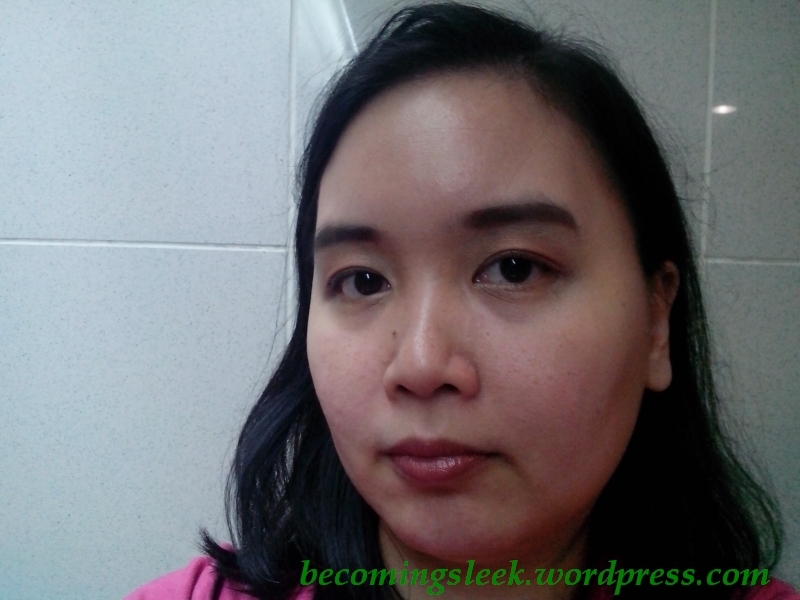 The second is my current favorite BB cream. It performs so well for me and it’s a multitasker as well. I always keep coming back to this whenever I don’t know what to put on my lips. The longetivity and robustness of this trumps everything else. Again another double-item category. 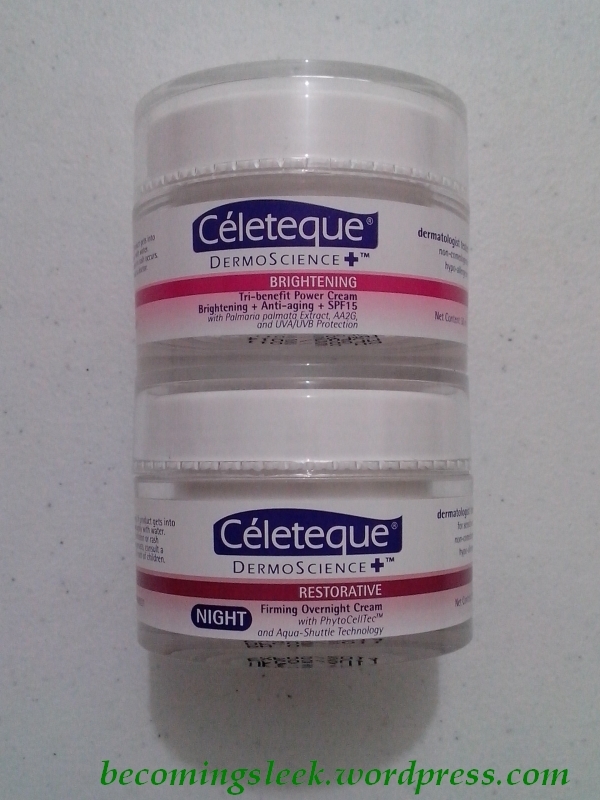 These are my current day cream and night cream respectively. I am so far enjoying them, but I am waiting for about a month of use before I write a formal review. Yep I cheated again. I have two items in my nails slot. 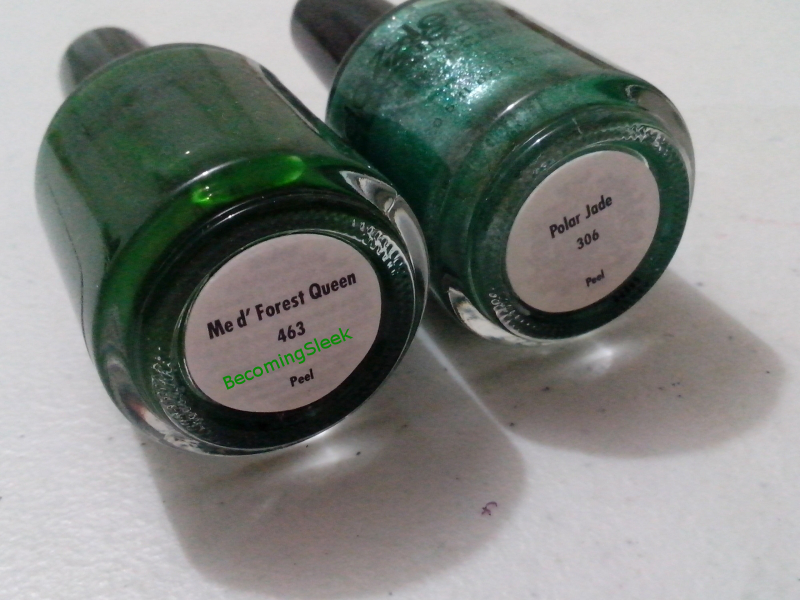 My newest DD lacquer deserves this spot of course, since green is my favorite and this is such a beauty. 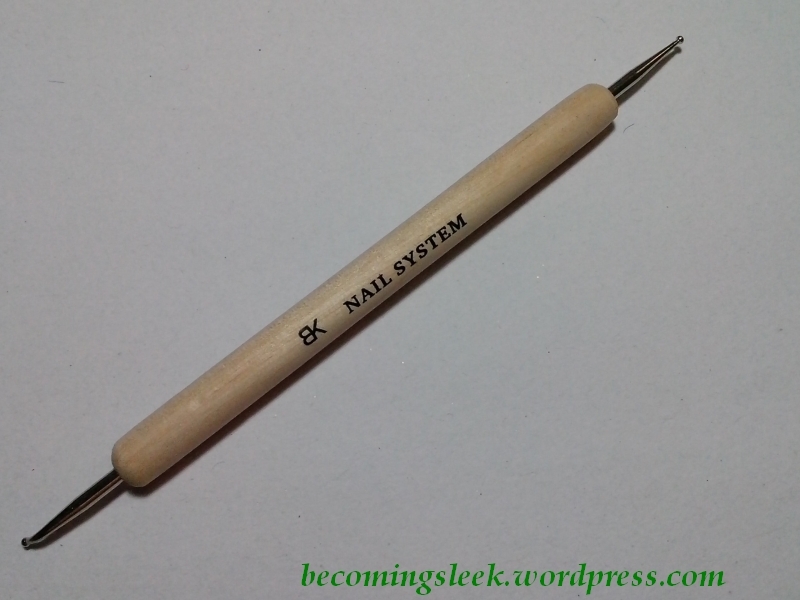 My dotting tool also made it, since it helped me do my best nail art so far. 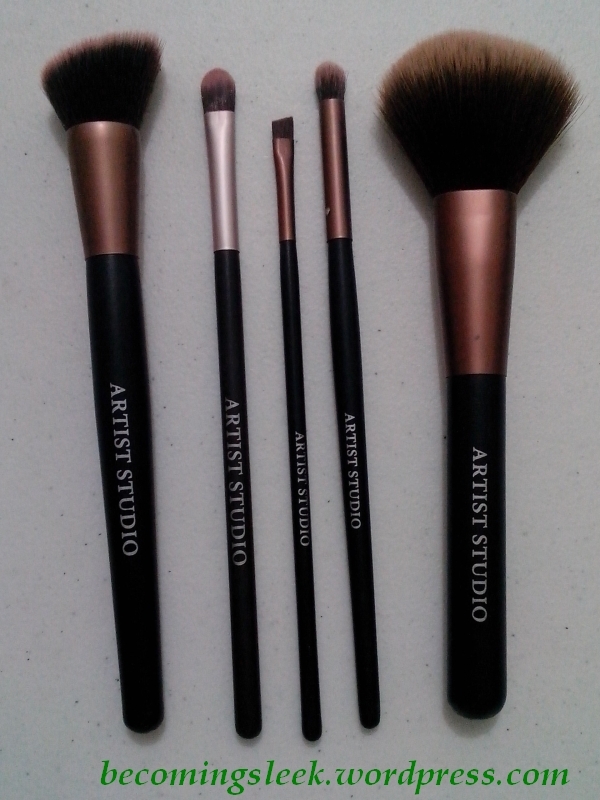 I have a number of Artist Studio brushes, and by far I am liking them all! The ones I can’t live without are the powder brush, the angled flat top brush, the eyeliner brush, and the eyeshadow brush. I plan on writing a review of these as soon as I complete the collection (I’m just missing 3 or 4). There you have it for June! Do you like reading about favorites? Should I continue doing this? 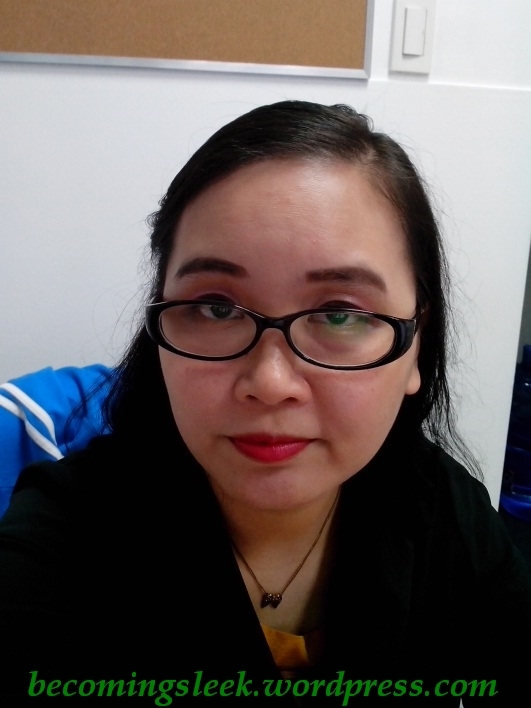 I usually only have 20-30 minutes to prepare in the morning, since I have a 2-hour travel time to go to the office. This is what I would usually wear on my face on a typical office day. What’s your basic office look? 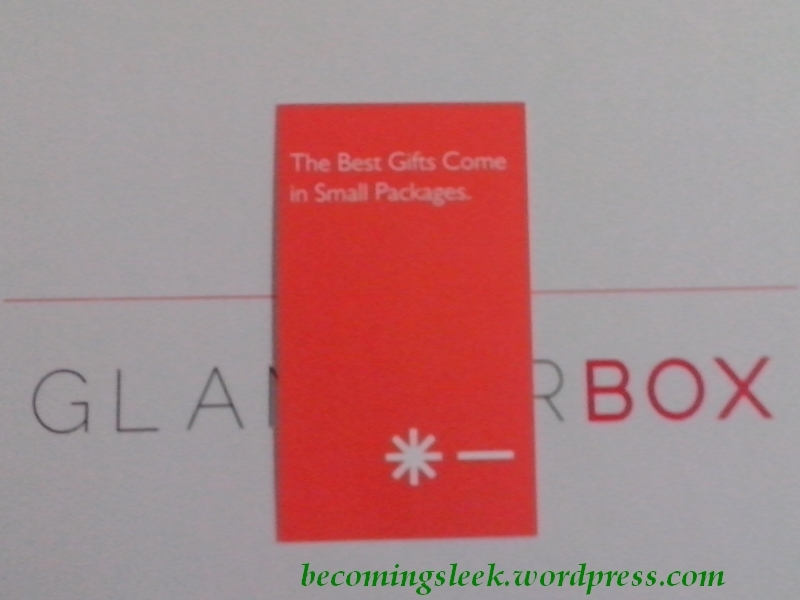 You may have noticed that I didn’t do an unboxing for the May Glamourbox. This isn’t because I was not able to subscribe, but rather because Glamourbox has decided not to be a monthly subscription anymore. How it works now is that they will release a box once they are able to fill one. I think that it is a great decision. 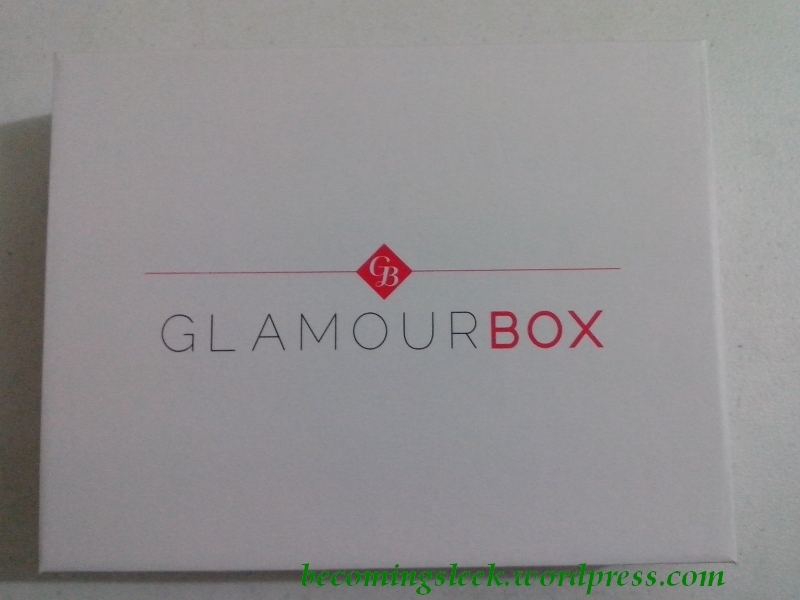 Rather than releasing sub-par boxes, Glamourbox will be able to keep the quality of the subscription high. The June box is the first box released since this decision. 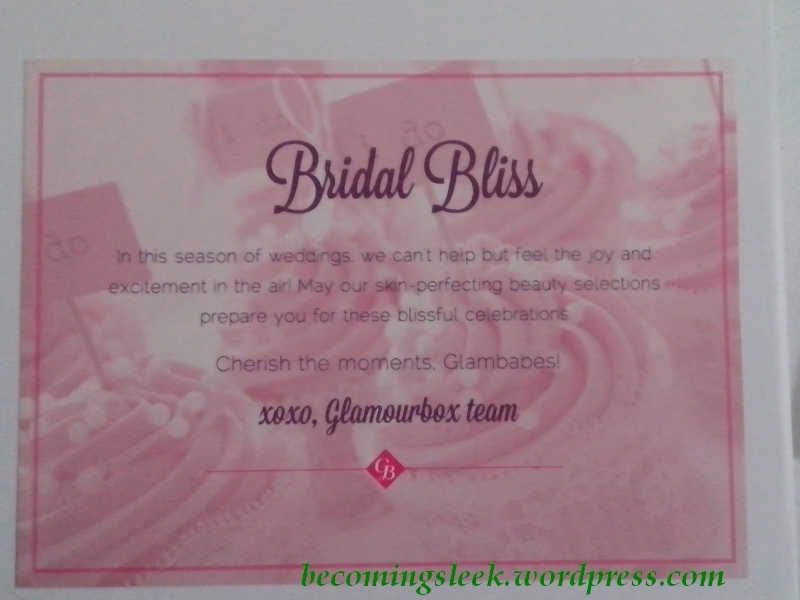 This month’s theme is Bridal Bliss, since June is is the most popular month to get married in. According to the welcome card, “In the season of weddings, we can’t help but feel the joy and excitement in the air! 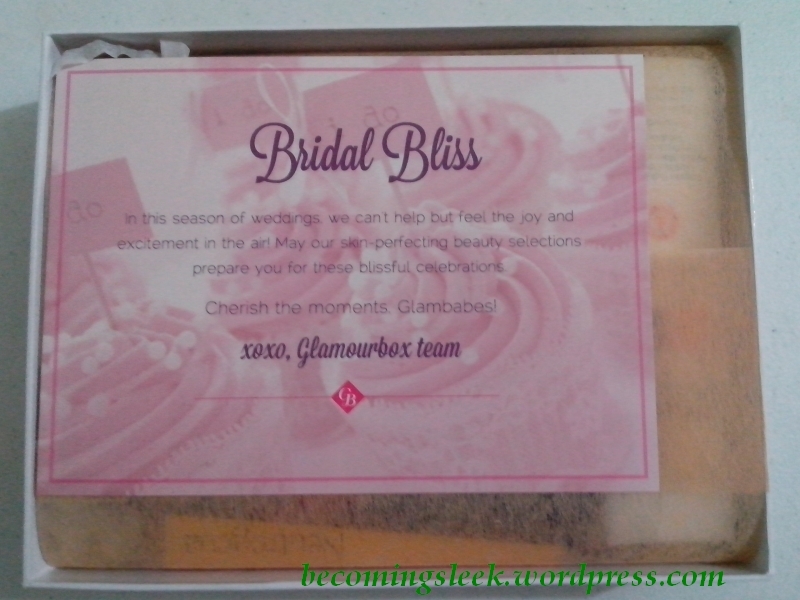 May our skin-perfecting beauty seletions prepare you for these blissful celebrations.” I am pretty excited about this theme since Glamourbox has already released the theme name weeks before they shipped the boxes. Admittedly I’m already married (almost 8 years!) but I wouldn’t mind recapturing that “bride feeling”. This is how it looks like when opened. This view gave me a pretty bad first impression. 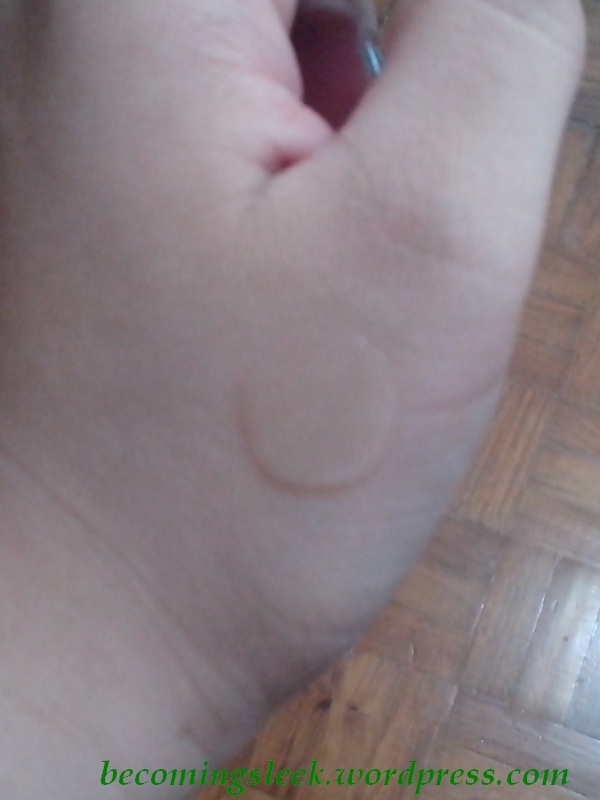 Yes, it’s yet another tube of Physiogel Intensive Cream. This is my third! (the other two from the June BDJBox and November BDJBox) Now granted it’s not any fault of Glamourbox that BDJ has included this product twice already, but I’m pretty sure Glamourbox should be watching their competitor. Hopefully the rest of the products make up for it. 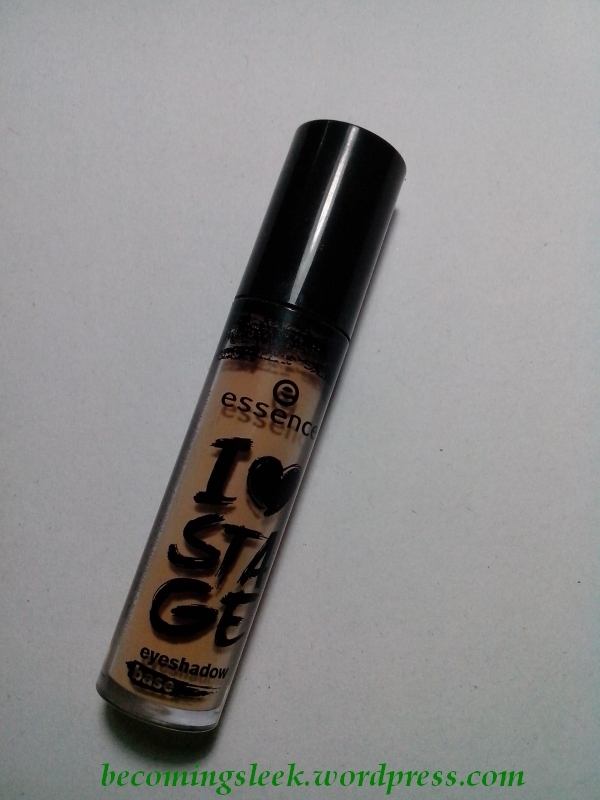 This is a full sized tube (50ml) which costs Php574.50. 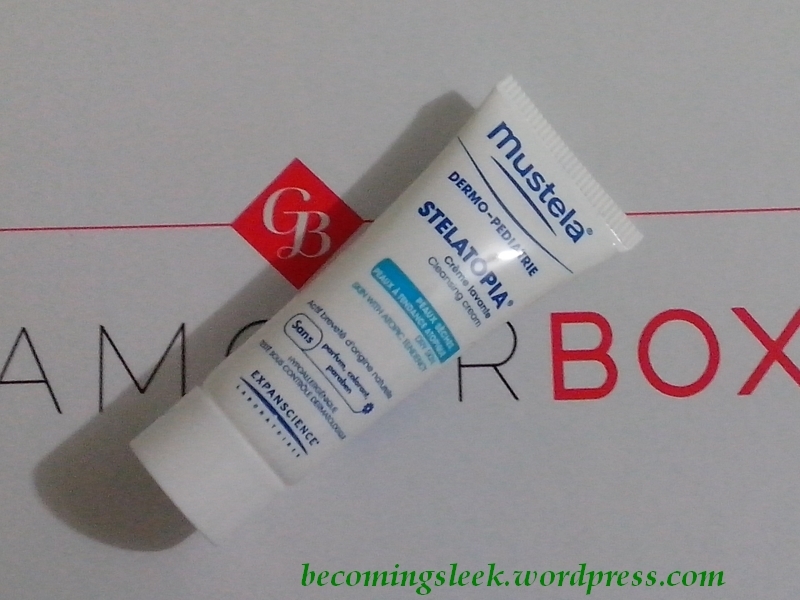 In the order listed in the welcome card, let’s start with this sample tube of Mustela Stelatopia Cleansing Cream. At first I thought this was a facial cleanser, but the welcome card says it is actually a bath and shower cream. It’s also from Mustela, which means it’s specifically formulated to be gentle to babies. I will definitely give this a try. In fact, I’ll have my daughter (7 years old) try it! She has a similarly maarte skin like mine, so we can do a true road test of this and see if it makes her skin react. 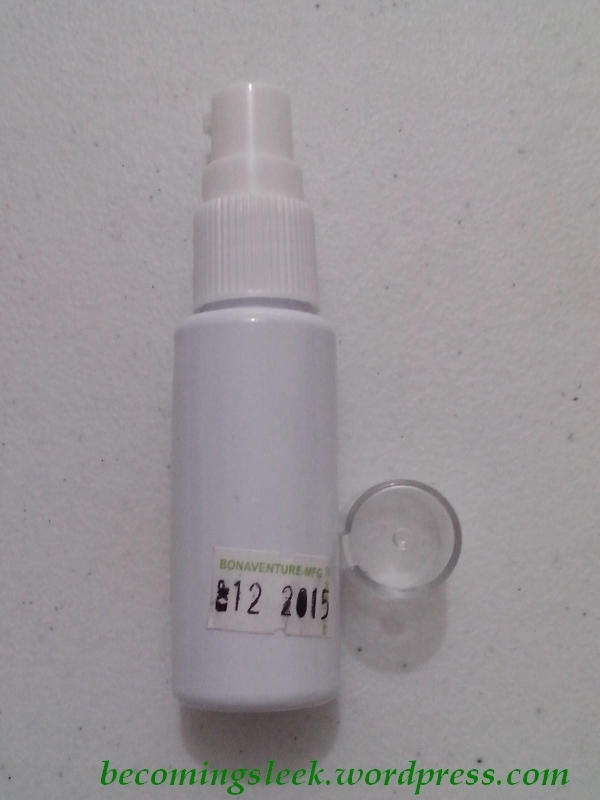 This is a 10ml sample, and costs Php47.50 (full size 200ml, Php950). 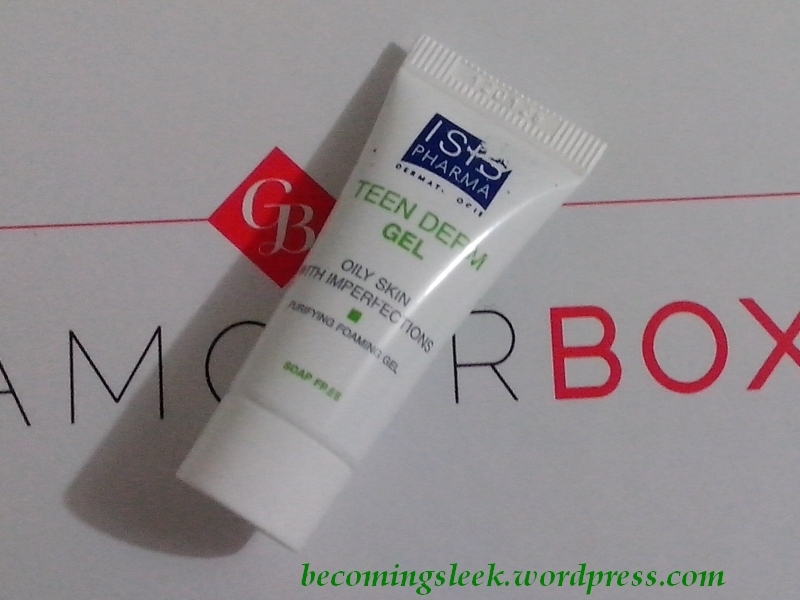 This next one is Isis Pharma Dermatologie Teen Derm Gel, which is an actual facial cleanser. 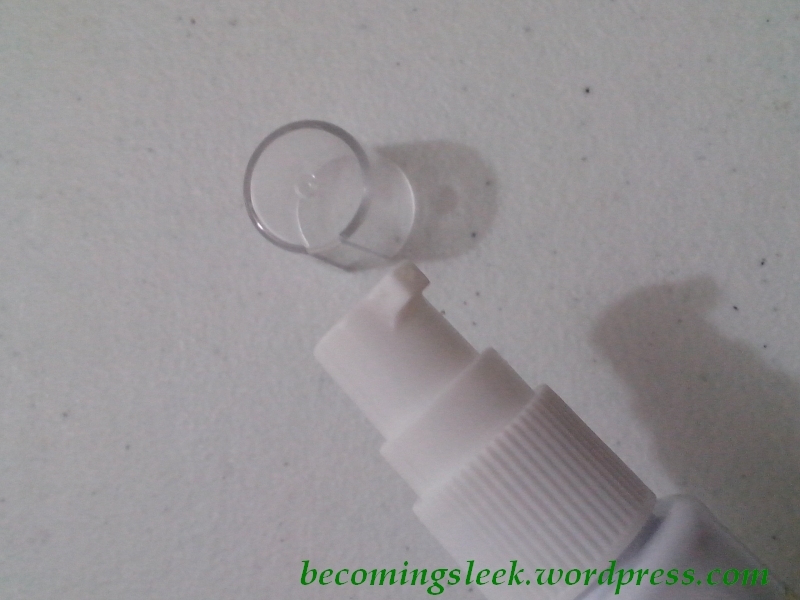 It is, however, targeted for teens and adults who have oily skin. I’m not as oily as I once was, so I don’t think this product is for me. 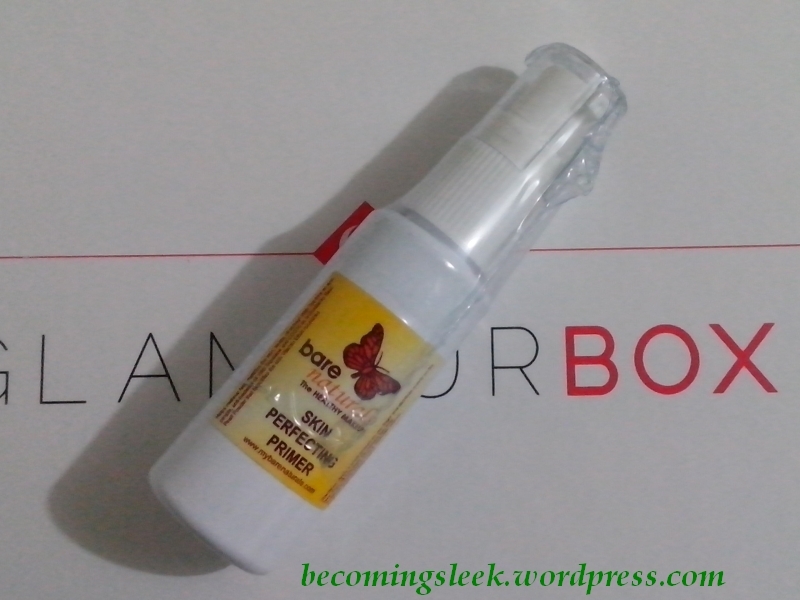 This is also a 10ml sample, which costs Php112.50 (full size 40ml, Php450). I’ve seen boxes online that has a different variant: they have the Mustela Physiobebe Cleanser, which I think is a makeup remover. 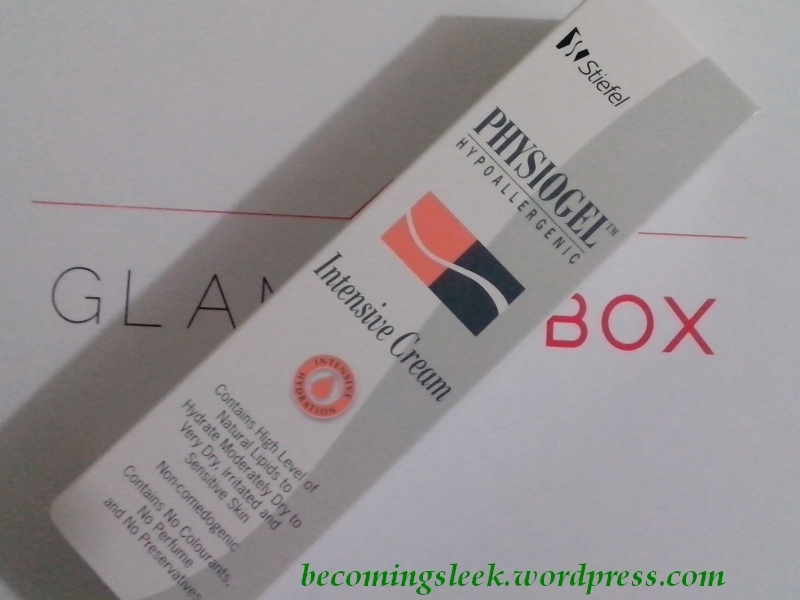 I’ve already mentioned the Physiogel Intensive Cream above, so let me move on to the next product. 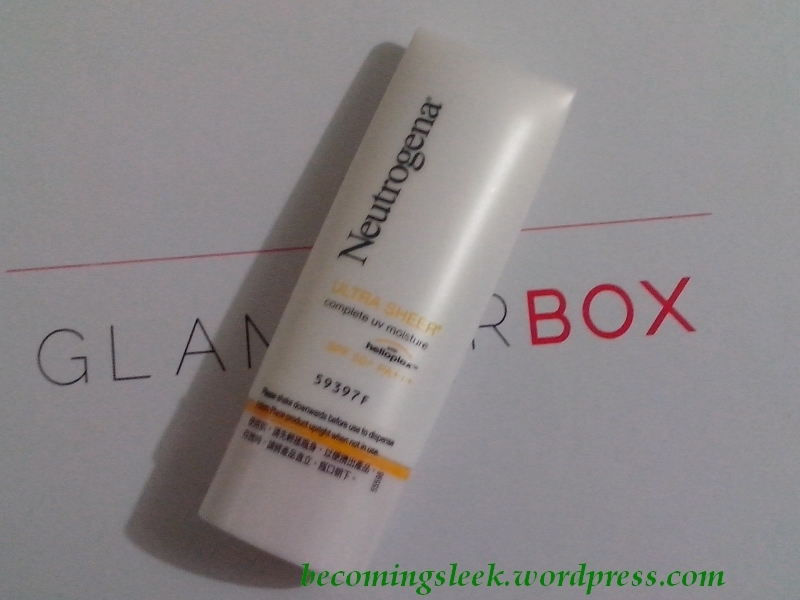 It’s Neutrogena Ultra Sheer Complete UV Moisture Sunscreen. This is an SPF50 sunscreen, and applies on sheer so it can be used underneath makeup. I am never against having lots of sunscreen products as I burn and darken easily with sun exposure, so I’m quite happy receiving this. It’s a good thing it’s a different product than the one I received with the BDJ Elite Box. I think this one is more moisturizing than the Dry-Touch. 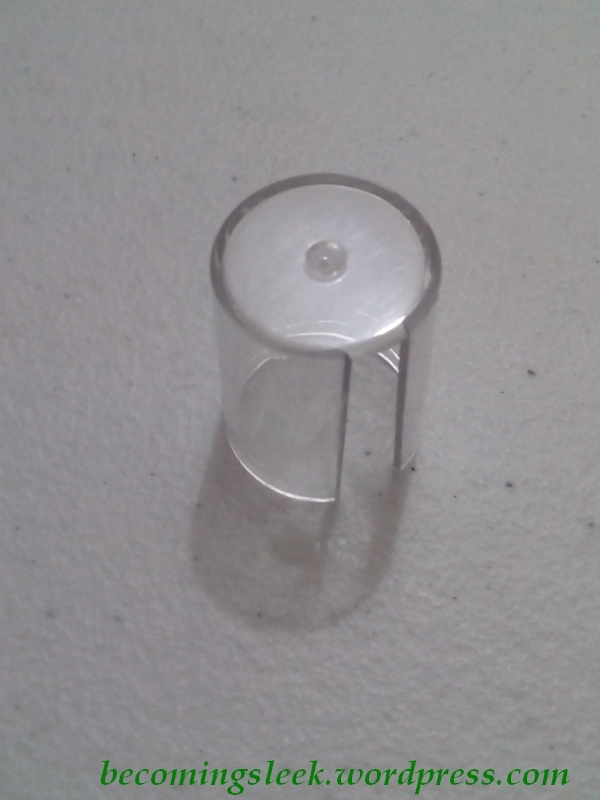 This is a full sized tube, 30ml, and costs Php460. 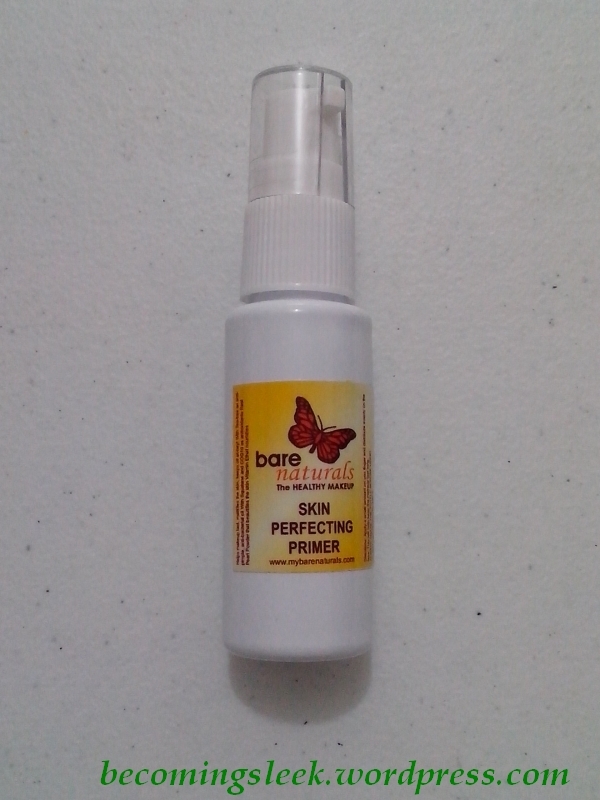 This next product is very intriguing: Barenaturals Skin Perfecting Primer. 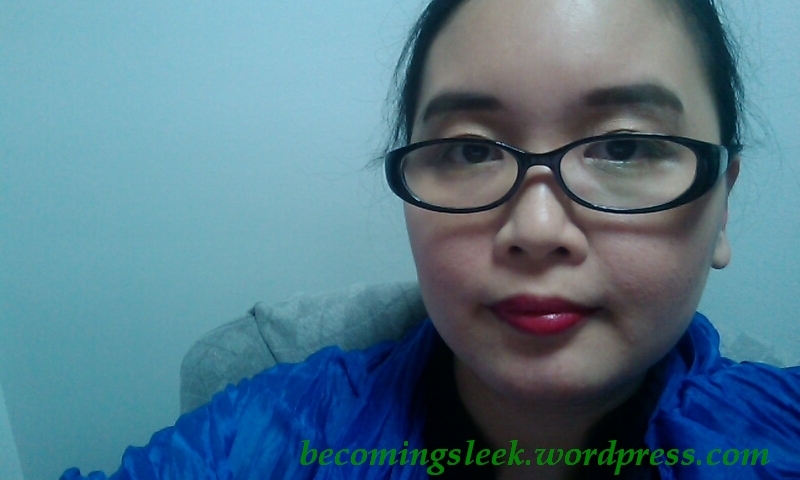 As I mentioned numerous times on this blog, I have quite a lot of pores so primers are my best friend. I’m quite excited about this primer since it claims to use natural ingredients (pro for sensitive skin!) and mattifies the face. It is also not that expensive, as the full sized product (30ml) is only Php398. It’s about the price of the Maybelline Baby Skin primer. One thing I noticed though is the sub-optimal packaging. What is with that spout?! Barenaturals also has a second product in this box. 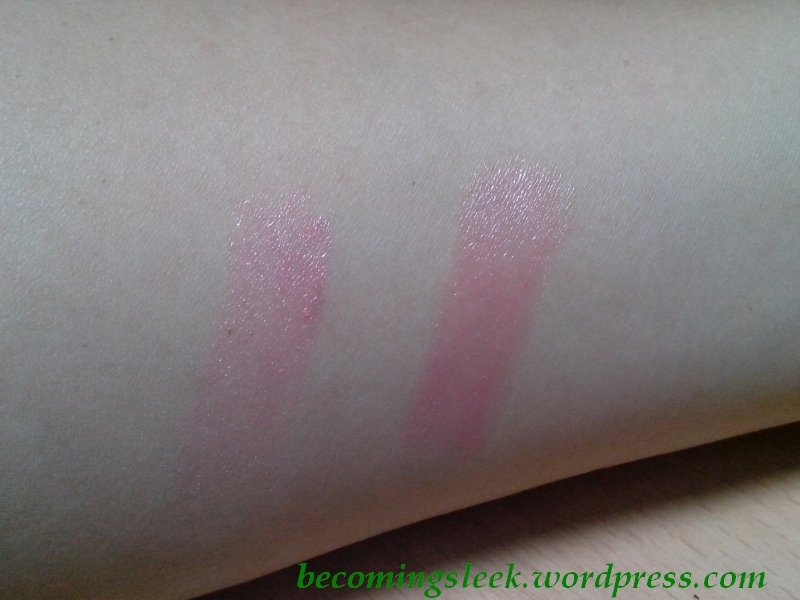 It is the Lip Stix in I Love You This Smooch, which is basically a tinted lip butter. 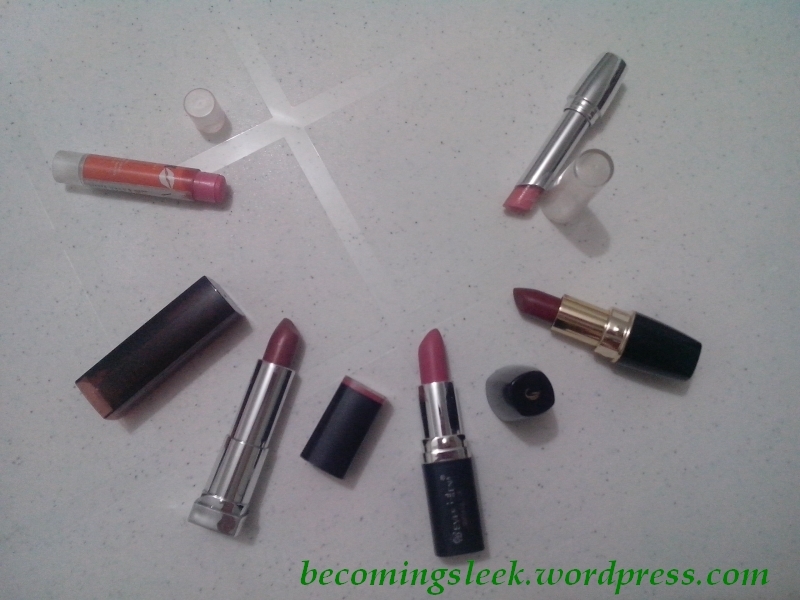 I’m quite a lip product enthusiast, so this one is actually my favorite in the box! This uses natural food-grade ingredients and is perfectly safe to use even by kids. Check out how unique the tube is! It’s very slim! 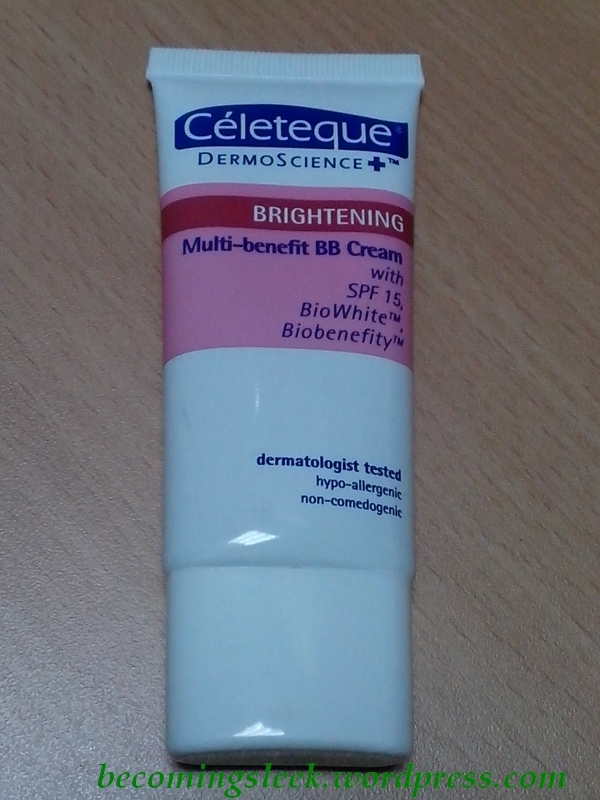 This full sized tube (4g) costs Php148. 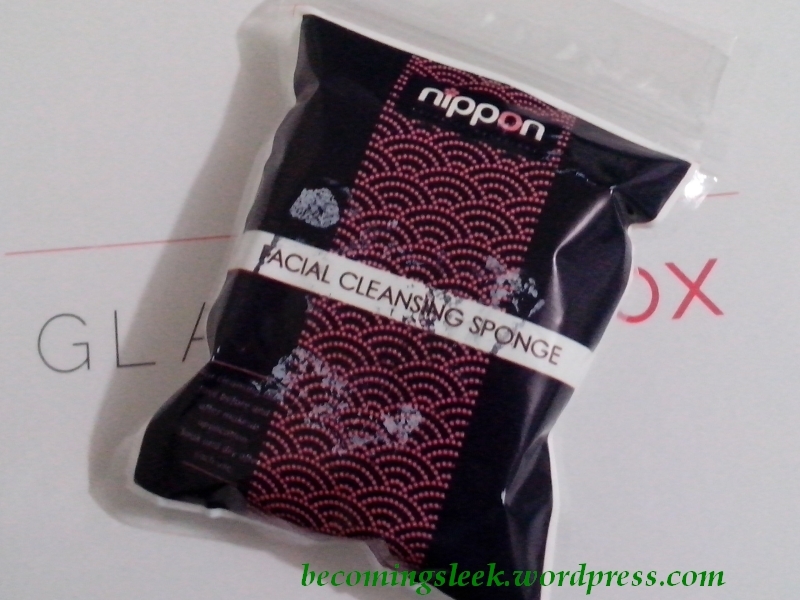 Lastly we have Nippon Cleansing Sponge. Unfortunately this is a repeat product for me, the first one appearing in the November BDJ Box. 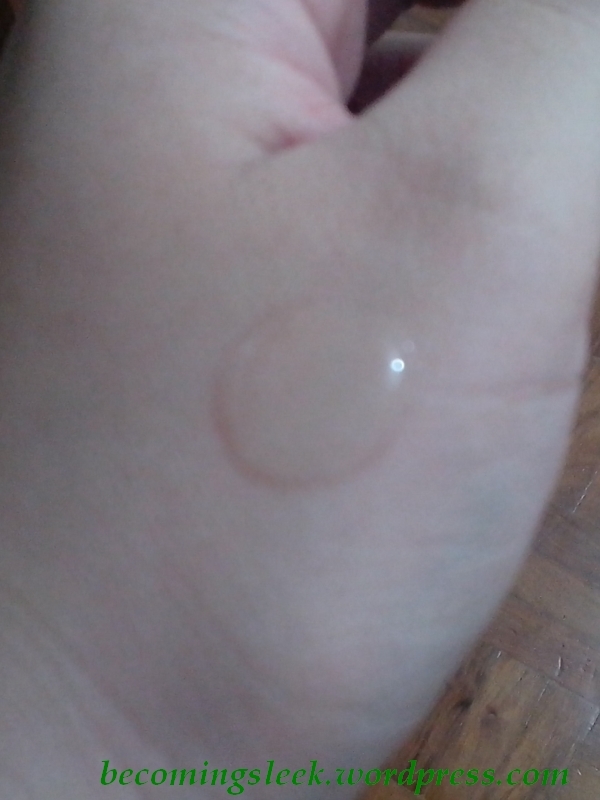 On the other hand, I actually really like this sponge because it’s quite durable and gentle on the skin. My daughter loves using this to wash her body. Getting a second set of sponges is actually good; it means I can retire the old ones. This 2-piece set costs Php65 (a full 10-pc set costs Php325). We actually have a couple of vouchers in this month’s box. 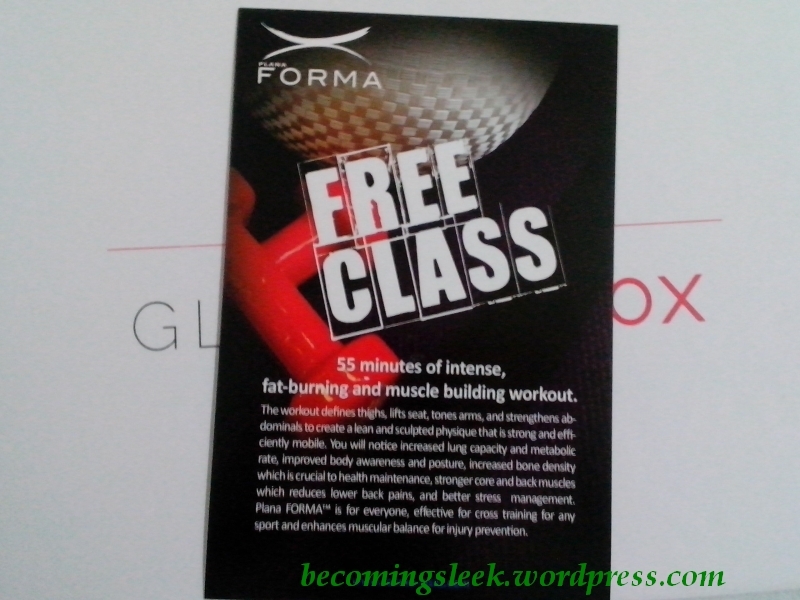 We have a free 55-minute class of Plana Forma at either of their branches (BGC or Centris Walk), and expires on October 31. I actually might try this one, as I am in dire need of exercise. 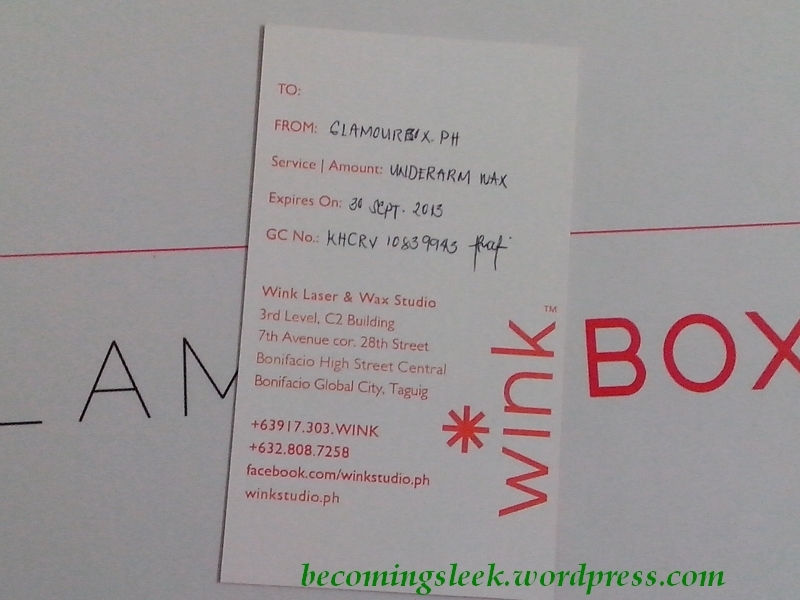 The second voucher is a free session of underarm waxing at Wink Laser and Wax Studio (BGC), expiring September 30. I might avail of this as well (who doesn’t want to get rid of underarm hair??) since it’s free. Some boxes have a nail art voucher instead of the underarm waxing. I might actually prefer that! 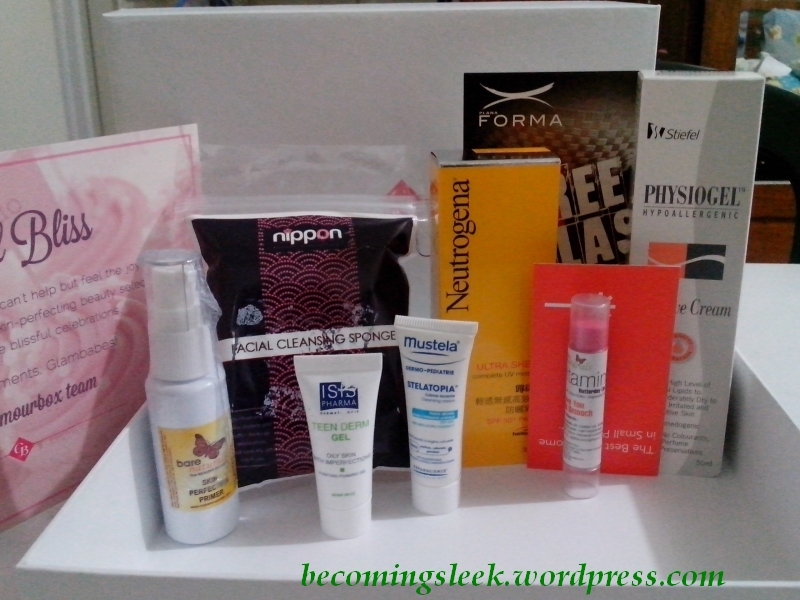 My impressions of the June Glamourbox: Beyond the bad first impression (I didn’t really need a third Physiogel tube) I’m actually pretty happy with what I received. My favorites are the two Barenaturals products, and I can’t wait to try them. The vouchers are actually something I can use! The products actually match the theme in the sense that these products aim to make the bride’s face and skin perfect for her wedding day. I also like the fact that they introduced two brands I’ve never heard before (Barenaturals and Isis). 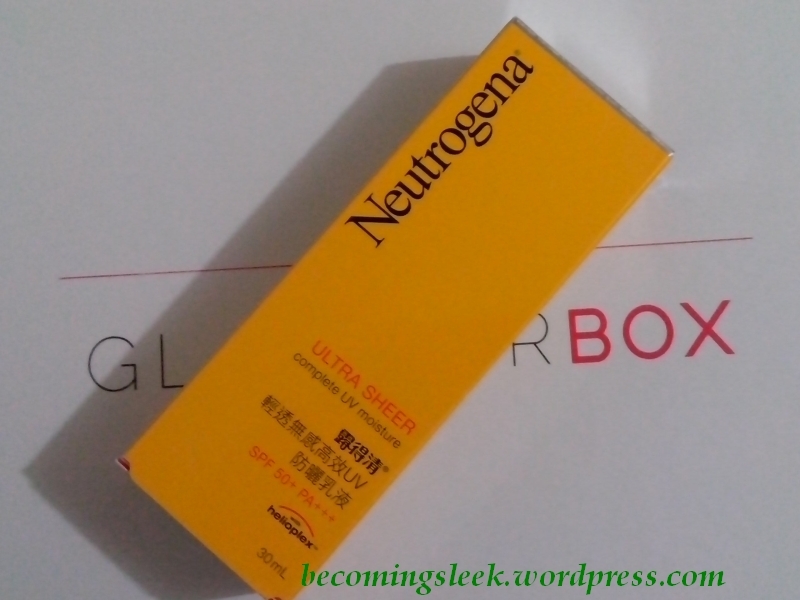 Value review: The total value of this box is a smidge above Php1800 not counting the voucers, which is relatively consistent with the previous boxes. If we remove the repeats, we will still have a value of Php1166 which is still about twice the subscription cost of Php595. Still great value, in my opinion. I think I am correct when I said that Glamourbox made a great decision in keeping high quality over quantity.